The Shumatech DRO350 is a kit based digital readout display for low cost vernier scales and can be bought for either a milling machine or lathe. 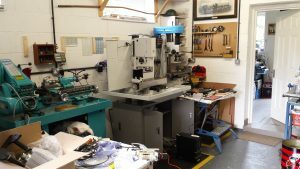 Shumatech appears to no longer trade but I managed to buy the full lathe kit including the box from the UK agent. The US agent is Wild Horse. See previous post from France. The product is quite well conceived and has a wide range of functions beyond just a basic readout of X,Y,Z scales. The kit was simple to put together and I quickly had it working as a lash up on the bench. 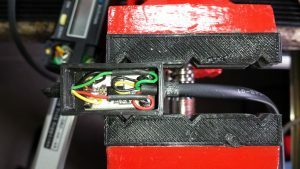 The first problem was the fact that all the connections are configured to come out of the back plate of the plastic enclosure. For my application this was not ideal. The connectors as supplied with the kit also were not the same as the RJ11 on my scale cables. 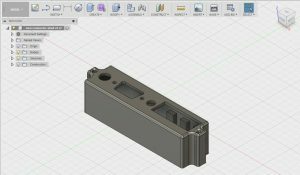 I created a ‘pod’ in Fusion 360 that would mount on the end wall of the box and carry all the connections. This was 3D printed in black to match the enclosure supplied. Space was tight to fit all the connections into the space and I had to resort to RJ10 style connectors for the scale leads as RJ11 were too large. 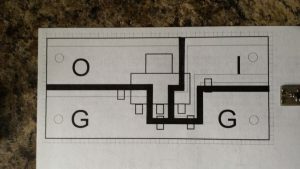 I had to extend some of the connecting leads. That aside the ‘pod’ concept worked well. There is significant debate on the internet about the Shumatech design and its apparent instability or flickering of the digits on the display. Opinion seems to be mixed as to where this originates. The PCB design is not ideal with some very long thin power supply tracking and no ground plane screening. My two small scales seemed to not suffer this problem but my long scale definitely had a problem. Once again opinion on the internet is mixed as to how to overcome this. 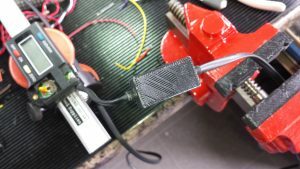 This ranges from changing the wiring in the readout box for better earthing, leaving the batteries in place in the scales or replacing them with capacitors to add smoothing. I tried all these to no real positive effect on the long scale. I even tried inductive decoupling of the connections at the scale terminations. I took a step back and tried to run the scale on a separate 1.5V bench power supply on long leads and lo and behold the problem still existed suggesting it was a power supply pick up fault and nothing to do with the Shumatech electronics. 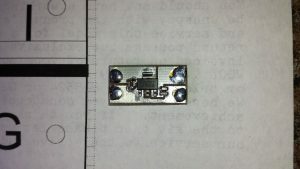 I had to hand a small 9V to 1.5V power supply module based on the AMS1117 “3 legged” integrated regulator. I connected this close to the scale and ran the regulator input from 5V. The jitter disappeared suggesting it was really about the pick up on the supply to the scale. 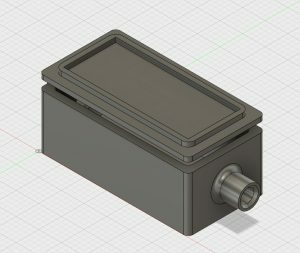 I had stock of the AMS1117 chips and SMD caps so I made 3 regulator boards and in Fusion 360 created a small box and lid to contain the regulator module. 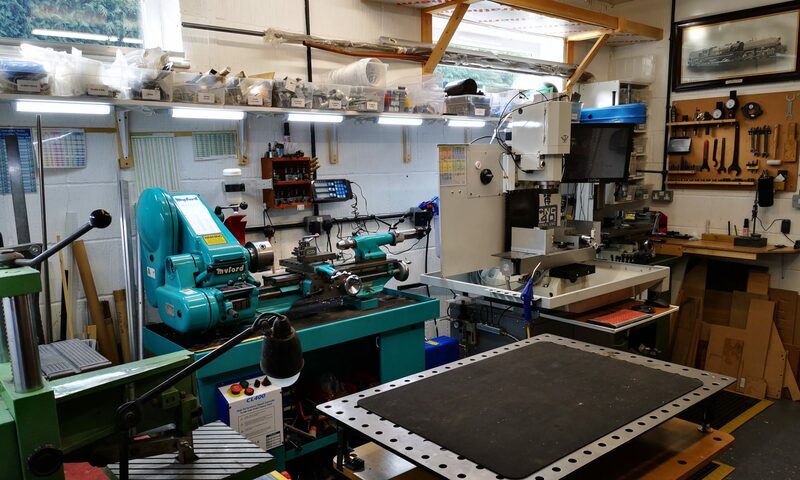 The pcbs were made as a first job on the Tormach 440. I hand coded the G Code to run a dentistry burr in the chuck to profile the pcb tracking. OK it was a simple job but it gave me some confidence on how to make the mill sing to my tune. Power supply module mounted in the plastic box and in series with the lead to the scale. The finished assembly was then connected in line with the scale lead and close to the scale. For consistency I modified all three scales in this way. I needed a 5V feed at the display end and to achieve this I cut the display positive lead from the pcb connectors and connected them with a flying lead to the 7805 on board 5V regulator. On power up the scales all worked well with no obvious jitter and my Myford Super 7 now has a nice readout facility. For the full story see the following Shumatech DRO350 Experience. We have had a few days in France to chill out and cut the grass …. lots of grass. The first weekend was spent in Vichy supporting our son at the IronMan event. It was very hot but he did well, coming 7th in his age group. Once back at our home in the Lot we had a few friends and family drop in to visit which was nice. Euro exchange rate is awful, almost parity with GBP, so things are a bit more expensive than normal. Our son arrived and he also plays golf so we played Souillac Country Club course and a few days later decided to try the Brive Municipal course. As members at Souillac we got a discount at Brive from the normal EUR40 for 18 holes down to EUR32 which was worth having. The Brive course is long and runs along a valley with a stream running through. Lots of holes with water as a result. The weather was warm so we drooped quite badly after the half way point. Between us we lost quite a few balls. Given the choice I think we would all prefer Brive over SGCC. Done quite a few jobs about the place while here and also some home workshop related activity. One of the many things that is good about Fusion 360 is the cloud storage so I could log on in France as if sat at home. We get a 9Mbps connection in the village which for rural France is very fast so connecting to Fusion 360 is no problem. I bought a ShumaTech DRO350 readout kit for my Myford Super 7 before we came out. It is a well thought out kit but sadly the originator of the product no longer seems to be around and promised later versions never appeared. 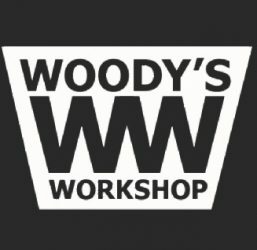 Wild Horse Innovations are the US outlet and they are promising a replacement kit some time in the future. The UK source is Model Engineering Digital Workshop. There are allegedly electrical noise issues with the product and looking at the PCB layout I can see why but I have yet to power it up. The kit comes with a box with all the connections out of the back face which is not ideal for mounting over the Myford Super 7. My DROs are cheap Chinese caliper devices and have RJ11 connectors on them which is not compatible with the kit connectors. Some of my time here in France has been spent designing a pod in Fusion 360 to fit on the end of the readout box to allow the connections to come off the end. Looking forward to getting home to run the 3D print of the pod and get the project up and running and of course getting back to the Tormach 440. The arrival of the Tormach PCNC440 demanded a review of my compressed air infrastructure. I have Bambi 24V pot belly compressor which previously only fed a dust off blower. In addition to this, the compressor now has to feed the new Tormach power drawbar and the Fog Buster coolant system. 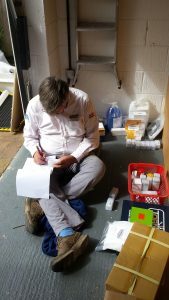 To aid distribution I sourced locally a 4 port manifold with an in and pass through in line. This gave me a couple of spare ports for future expansion. The Tormach PCNC440 arrived with US style push and lock black tubing and fittings with ubiquitous 1/4″ BSP threads. Thank goodness something is common. In total I had something like 15 threads to seal and PTFE tape did not do the job. Soapy water revealed a bubble factory. A quick scan on the web and it seemed that Loctite 577 was recommended. RS had it in stock and it was a revelation to seal the threads. You just squeeze a thin ring of 577 around the thread and screw it home. Job done ….. but maybe they won’t ever come apart again …. well that’s a problem for another day. 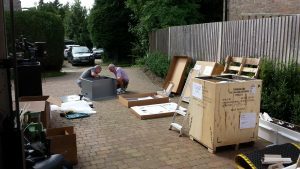 Last Monday the delivery lorry arrived and the driver skillfully backed his 7.5T truck onto the drive and dropped off a number of boxes. Much excitement ensued not only from me but my three helpers – Andy, Dave and Ian. Dave and Andy set on immediately to assembly the stand and Ian and myself continued with planning how and where the machine would fit into the workshop. 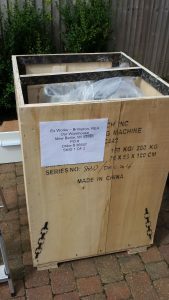 Great news that my new milling machine has arrived in the UK and is awaiting clearance at Southampton docks. (Not so good news but as budgeted was the 20% VAT on the shipped total and import duty of 2.5%). Some significant moving round is going to be needed in the workshop to get it installed and I expect a number of days downtime while I get to grips with it. On the bright side I have some close friends keen to lend a hand.